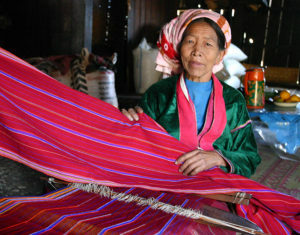 The Palaung people of Myanmar are divided into three groups, each of which has its own language. These three languages are all thriving; they are spoken in the home and markets by speakers of all ages. The Palaung live in the mountainous northern region where census taking is difficult and results uncertain. The Rumai Palaung number around 157,000; they have no Scriptures. The Shwe Palaung number about 229,000; they have no Scriptures either. The 294,000 Pale Palaung do have a Bible. The Palaung are agriculturalists. They farm their heavily forested mountain land with the slash and burn method. Tea is grown at high elevations, and rice, fruits, and vegetables are grown at low elevations. Opium poppy is a cash crop. These unreached people of the 10/40 Window practice both Theravada Buddhism and their traditional animist religion. Theravada Buddhism is known as the Way of the Elders because of its adherence to the Pāli Canon (oldest Buddhist scriptures); it permeates every aspect of life. Animism is the belief that spirits reside in both living and non-living things. The Palaung live in fear of these evil spirits which have power to either help or harm and must be appeased with prayers and sacrifices. Palaung traditional animist religion is syncretized with Buddhist beliefs; altars to the “nat spirits” of their ethnic religion are found at Buddhist temples. How shall they hear the truth without a preacher? How can a preacher preach effectively without a Bible?